Jack Arnold, director of Black Eye, is in charge here, and his great feel for desert atmosphere and landscape is much in evidence! We begin with a pajamaman staggering through the sage, and when we see his face he looks like the guy from Goonies, only worse! It’s a real mystery, and the local sawbones, a dashing fellow played by John Agar of The Mole People, investigates matters by speaking with Professor Deemer, the reclusive scientist conducting his research in a lonely desert mansion! Professor Deemer is of course played by Leo G. Carroll from North By Northwest, and it’s a canny performance because, without resorting to obvious actor tricks, Carroll is able to subtly undercut his natural avuncularity and show us hints of the driven scientist beneath! This effect, in concert with his lumpen physiognomy, offers prodromal hints of the drastic changes to come, ha ha! Looks like Deemer and his motley gang of monkeyfaced assistants are working on a plan to make animals really big! Ha ha, but there’s a fire, and sadly all the animals are wiped out except the monkey and, of course, the tarantula! When it leaves the house it’s about the size of a coffee table, but later, when sheep and cows and horses and even people begin to disappear, or at least everything but their bones disappears, we realize that it must have grown substantially larger! The town sheriff, played by a grinning Nestor “Creature From the Black Lagoon” Paiva, is baffled by the craziness that has beset his community, but through it all he never stops grinning! Pools of white goo are discovered, and ol' Doc Agar barely hesitates before tasting the stuff! 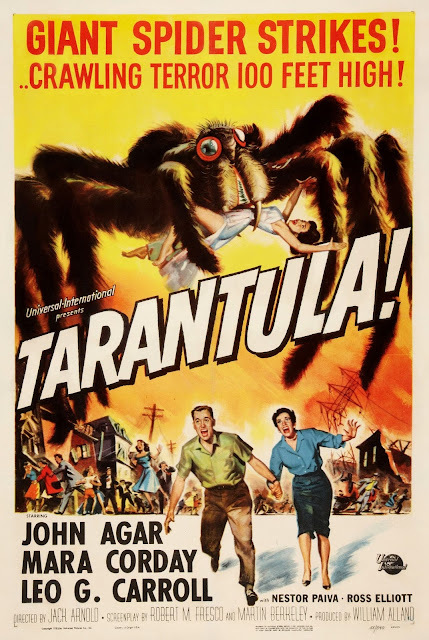 And a pretty scientific assistant, played by Mara Corday from The Giant Claw, arrives in town just in time to be menaced by a spider the size of the Taj Mahal! Eventually the money shots begin in earnest: the truly huge tarantula stalking the windswept deserts! The trick effects are pretty good, and I particularly liked the scene where that big old arachnid peeks in the window where the lady scientist is sitting! He gives her a pretty good scare, ha ha! But popguns and dynamite fail to stop the beast, and finally it’s up to Clint “In The Line Of Fire” Eastwood to put things aright with napalm drops from his jetplane! Then it’s quickly reduced to a pile of enormous burning pipecleaners, which must have been fairly unpleasant for any towns downwind of it! I’ll tell you this: I like Tarantula, but it never quite overcomes its one major problem, which is that the monster is just too darn big! Ha ha, this isn’t Godzilla after all! If it was maybe the size of the crab in Island Claws, now, that would be scary! But it’s still a really enjoyable picture, and a solid addition to the big bug cycle we all love so well! I give Tarantula two and a half desperate ranchers!